If you want a showy plant for a warm weather sunny garden, then Gaillardia grandiflora is a great choice. They are easy to grow in sunny gardens. The two choice plants are ‘Two Moons’ with its burgundy red flowers with many flecks of yellow and ‘Yellow Shield’ a true yellow flower with red centres. Gaillardia have been used in mixed perennial gardens since they were discovered. Planted in sunny gardens with well-draining soils they thrive. Reasonably drought tolerant Gaillardia will grow reasonably well even in drier garden beds once established. They were used in the English and French flower borders of the eighteenth century. It is true to say that the hybrids are superior and more vigorous that either of the parents. In some parts of the USA some plants have naturalised along roadsides.The flowers on both are large at about 6-8cm in diameter. They last well on the plants but are also long lasting as cut flowers in interior floral decorations. 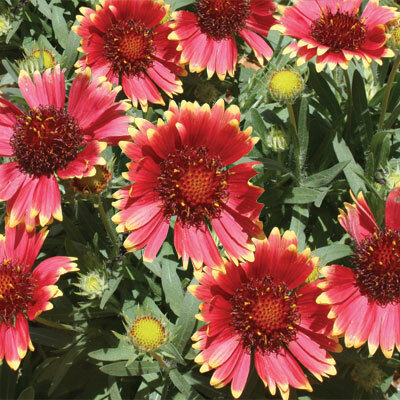 Gaillardia can be planted in perennial plantings with confidence. In colder areas during winter a covering with some branches of evergreen shrubs is advisable. Plants can be lifted and divided once the last of the cooler weather has past. Overall care is not onerous. At the beginning of the growing season an annual application of a complete balanced fertiliser is applied, weeding is kept to a minimum by mulching and overhanging branches of other plants are removed to let in lots of sun. Keep the plant flowering by removing the spent flowers as they fade. Gaillardia are native to the New World from the southern USA into Mexico. Two species are from South America. Gaillardia grandiflora hybrids use G. pulchella and G. aristata as their parents. They belong to the daisy family Compositae. Gaillardia is named for the French patron of botany from the eighteenth century Gilliard de Charentonneau. Hybrids were established by early eighteenth century breeders the resultant new plants being widely planted wherever cottage gardening became popular. The common name blanket flower is used because the flower colours look somewhat like the colours of Native American blankets.